The Master’s of Business Administration (MBA) program at Laurier’s Lazaridis School of Business & Economics is recognized worldwide. It is no surprise, then, that students from more than 10 different countries have enrolled in the program. For many international students, the Pre-MBA — an eight-month intensive English and business preparatory program run by Laurier International — is an option to consider before applying to a graduate program in a new country when English may not be the student’s first language. “The Pre-MBA was a fast-paced, challenging and highly engaging experience,” says Ruochen He. He is a former international student at Laurier who took part in the Pre-MBA program in 2015. He graduated in October 2016 with a Lazaridis MBA degree. The Pre-MBA launched at Laurier in 2012. Since then, students from around the world — including China, India, Japan, South Korea, Mexico, Mongolia, Pakistan, Russia, Ukraine and Vietnam — have participated. “Having the experience to adjust to life in Canada and the language skills to succeed before moving on to the MBA is a major benefit of the program." “The program is designed to help international students who would like to pursue a Lazaridis MBA gain the linguistic skills needed to succeed at the graduate level,” says Jason Whalen, Pre-MBA coordinator. The Pre-MBA is under the umbrella of Laurier International, a resource centre for international degree-seeking and exchange students who are looking for information or assistance. Through its programs like the Pre-MBA, the Laurier English and Academic Foundations program, and the International Peer Mentor program, Laurier International helps students with issues such as life in Canada and at Laurier, and Canada’s immigration rules and regulations. Whalen, who owned and operated his own language and education company in South Korea before joining Laurier, understands the intrinsic value in becoming comfortable with different styles of learning. As a recent MBA graduate from the Lazaridis School of Business & Economics, he also has first-hand experience in the program’s demanding curriculum. Every year, the Pre-MBA accepts approximately 20 students who are interested in applying to the Lazaridis MBA degree programs. The Pre-MBA program, which runs concurrent to the undergraduate calendar from September to April, sees 97 per cent of its students move on to successfully complete the Lazaridis MBA. “It is imperative that our diverse Lazaridis MBA degree programs expose our students to the globalized world in which they will work,” says Hugh Munro, director of the Lazaridis MBA program. “One of the many ways for our students to gain this valuable experience is by developing a personal and professional network of influential people from around the world — many of whom happen to be seated next to them in their classes,” he says. 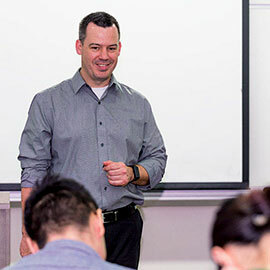 Through his close contact with Laurier’s Lazaridis School of Business & Economics, Whalen is kept abreast of the performance and needs of international students, which gives him valuable feedback on how to adjust the Pre-MBA curriculum. Whalen says that one of the biggest hurdles for Pre-MBA students is succeeding on the GMAT — a standardized English administered admission test required for MBA programs. In addition to offering courses on academic listening and speaking, business English and orientation of Western business and culture, the Pre-MBA program provides a GMAT course during the fall semester at no additional charge to students enrolled in the program. Prospective students who are interested in the Pre-MBA program should consult the admission requirements and contact Jason Whalen for more information.